Today on Sarah Emsley’s blog, John Baxter discusses Mansfield Park, Lovers’ Vows, and Shakespeare’s Henry VIII. Twenty-eighth in a series of posts celebrating 200 years of Jane Austen’s Mansfield Park. For more details, open Your Invitation to Mansfield Park. John Baxter is Professor of English at Dalhousie University, where he teaches classes on Early Modern literature, Elizabethan and Jacobean drama, rhetoric, and religion and literature. 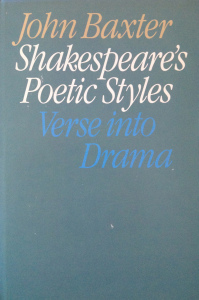 He’s the author of Shakespeare’s Poetic Styles: Verse Into Drama (Routledge) and many essays on Shakespeare, as well as on several other writers, including Ben Jonson, J.V. Cunningham, Janet Lewis, Yvor Winters, Helen Pinkerton, and George Elliott Clarke. With Gordon Harvey, he edited a collection of essays by C.Q. Drummond called In Defense of Adam: Essays on Bunyan, Milton, and Others (Brynmill Press/Edgeways Books), and with J. Patrick Atherton, he edited George Whalley’s groundbreaking translation of Aristotle’s Poetics (McGill-Queen’s University Press). Thanks very much for sharing this, Mary. You’re quite welcome. This is one of my favorite posts in the series.